Each Italian recipe is something amazing! Do you want to try it one? Let`s start with the delicious Gnocchi con sugo di pomodoro e basilico (Potato gnocchi with tomato sauce), one of my favourite! Suitable for vegetarians, for the preparation it takes circa 45 mins, but the cooking is just 3 minutes! 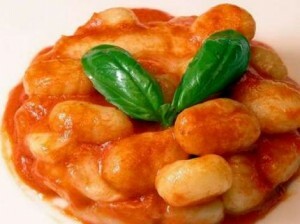 Gnocchi usually is a great dish for Sunday meal, especially in autumn and winter time. They can be topped by many different sauces (“Gnocchi with Pesto sauce” are delicious as well). For the tomato sauce, you need tomato sauce, few basil leaves and freshly grated Parmesan cheese. 1. Put the potatoes into a pan of cold water – slightly salted. 2. Boil them for 20-25 minutes until they get soft. 3. Drain the potatoes and peel them. Furthermore, mash them. 4. Spread some flour onto your table or a wooden surface and put all the mashed potatoes there. 5. Open an egg into a small bowl and whisk it. Add half of the flour to the potatoes and mix everything. In the while, add just 2 spoons of the wisked egg. 6. Knead the mixture for 5-7 minutes and add the last spoon of the egg. The final result should be elastic and not sticky. 7. Cut the dough in 4-5 pieces and make a ball of each. Press and roll the ball onto the surface with some flour and make a long strip tick as a thumb. 8. Cut it into two pieces, and from each start to take smaller and regular bits. Again make a ball with each of them. The results? Delicious gnocchi, ready to be boiled. Not to forget! Add a bit of oil to the boiling water: so your gnocchi won’t stick together while boiling. After 3 minutes, drain them all and add to the tomato sauce you already prepared! Very gently toss the gnocchi in the saucepan for a few seconds, add the basil leaves and the Parmesan cheese. This entry was posted on Saturday, March 26th, 2011 at 2:41 am	and is filed under Italian Recipes and Food. You can follow any responses to this entry through the RSS 2.0 feed. You can leave a response, or trackback from your own site.